On the first of May, I shared 7 Reasons why #OpenSnap is Singapore's next big thing. Sure enough, the food mobile application which allows global access to foodies have gone viral. Earlier this month, I was invited to a launch event of OpenSnap at The Flutes Restaurant and Bar at the National Museum of Singapore. They served really great food and it would definitely be a great place for locals to chill and relax. It is also a great location for expatriates and tourists for fine-dining. Totally loved the texture of the bread that was covered with nuts and seeds. The olive oil and vinegar added an extra fragrance and increased the moisture of the bread without turning soggy. We had Smoked Salmon Rosettes for appetiser and that was a great start to our meal. Made of Blinis, Citrus, Bottarga, and Creme Fraiche, the salmon was tangy and fresh. The combination of the slight saltiness together with the sweet orange slice was an ingenious idea— bursts of flavours explode in your mouth. I thought I was experiencing some sort of a pyrotechnic display of fireworks in my mouth! The cream of mushroom with truffle oil and chives was extremely comforting. Made purely with mushroom, it was very rich and had an earthly flavour. Served as a thick cut of prime beef striploin, I had the luxury of choosing medium rare. Although the chunk of beef was delicious to taste, cutting through it was as difficult as sawing a wooden bench with a penknife. The beef would have tasted better if thoroughly soaked in the black pepper sauce. I thought my jaws had a really great workout of the century simply by chewing on Flutes' beef. The marbling of the beef, if any. The fish scores much higher than the beef as it crumbles and melts in your mouth. The marination was done really thoroughly, with the sauce penetrating the inner veins of the fish. While the smell of herbs were not strong, the fillet does not have any hint of awful fishy smell. Any dessert goes well with Anglaise Sauce. One of my favourites, the caramelised walnut added a crunch while the blueberry a punch to every bite. Dipping the cake into the anglaise sauce is at your mercy, so you can choose how sweet you want your cake to be. The strong tasting coffee reminds me of the blue mountains of Jamacia. Strong and fine-tasting, the crema of the shot was extremely thick and frothy. At the heart of the coffee, there was no bitter powder to taste. The juices sold in the Flutes Restaurant and Bar are freshly squeezed. I have seen for myself how the drink mixer made the oranges from fresh oranges. There was no added sugar and the juice was really sweet from the oranges' natural sugar. 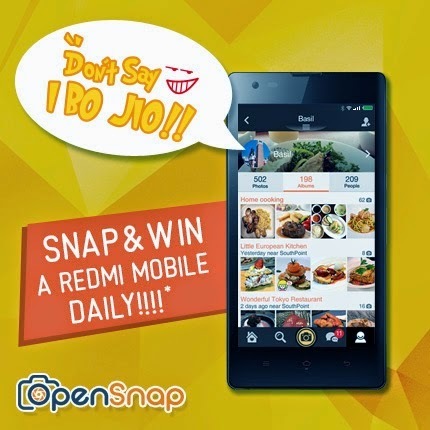 Stand to win a REDMI phone daily until 14 June when you submit five food pictures and hashtag #dontsayIbojio with OpenSnap.